Arlo Wire-Free HD Camera Security System with Pro Base. From kids and pets to an empty home or after-hours business, youve got a lot to keep safe. Day or night, indoors or out, Arlo takes the wondering and worrying out of life with the 100% wire-free indoor/outdoor home monitoring system. Security so simplejust place Arlos weatherproof cameras wherever you need them without needing to find a power outlet. They are battery powered that last up to 6 months. Then use the free Arlo app anytime, anywhere to see crystalclear live and recorded HD video. Arlo is always ready to go when you areadd extra cameras to your system with the touch of a button. 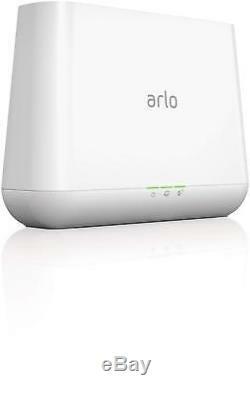 Features 100% Wire-Free Free of ugly power cords and wiring hassles Motion Alerts Receive push notifications and emails if anything moves Night Vision See whats happening even in the dark Weatherproof Put Arlo anywhereindoors or out HD Quality Enjoy amazingly sharp 720p live video FREE Cloud Storage Store & review recent activity with cloud storage Arlo Wire-Free HD Camera Security System. 100% Wire-Free Free of ugly power cords and wiring hassles. Motion Alerts Receive push notifications and emails if anything moves. Night Vision See whats happening even in the dark. Weatherproof Put Arlo anywhereindoors or out HD Quality. Enjoy amazingly sharp 720p live video. FREE Cloud Storage Store & review recent activity with cloud storage. A security guard in a box. Rain, snow, heat, coldnothing stops Arlo Wire-Free cameras from keeping tabs on your piece of paradise. Criminals know that half of every day is dark. What they dont know is that Arlo doesnt care. Set motion and/or sound alerts to ping you if anything moves. Never waste another second worrying. Enables Wire-Free operation of Arlo and Arlo Pro cameras. Securely connect Arlo and Arlo Pro Wire-Free cameras to the Internet. Connect a USB Drive to the base Station for local video backup. Smart Siren- 100+ decibel siren that can be controlled remotely. Compatible with Arlo Pro and Arlo Cameras. The Arlo Base Station securely connects Arlo and Arlo Pro wire-free cameras to the Internet via your home router, while providing long range connectivity and the best battery life for your cameras. Features include USB local storage backup, Smart Siren and upgrade options. Arlo Base Station vs Arlo Pro Base station. 300+ feet line of sight. 2.4 GHz 802.11n. 500 Mhz MIPS 74 K processor. 128 MB Flash, 128 MB RAM. 8.5 x 2.25 x 6.5 in. 6.9 x 2.3 x 5.0 in. (215.9 x 57.15 x 165.1 mm). (58.6 x 174.5 x 126.5 mm). 3.8 oz (110 g). 11.1 oz (316 g). 3 - Arlo Camera's. 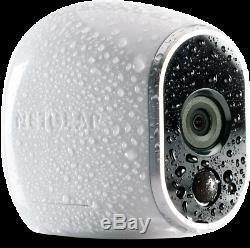 100% Wire-Free HD Cameras with Night Vision, runs on. Are compact, lightweight cells with relatively large voltages, and can last up to 6 months. Arlo Smart Home Security Cameras 100% wire-free, HD, Indoor/Outdoor video cameras and can be added to any Arlo base station system. Free apps enable remote monitoring from anywhere and with the built-in night vision youll even see in dark. What's in the box? 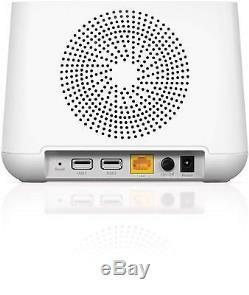 (1) Base station with power adapter. (7) Days of FREE cloud recordings. This product is backed by a NETGEAR limited 1-year Hardware. The item "Arlo Security System, Pro Base+3 Wire-Free HD Cameras Indoor/Outdoor, Night Vision" is in sale since Monday, October 15, 2018. This item is in the category "Consumer Electronics\Surveillance & Smart Home Electronics\Home Surveillance\IP & Smart Security Camera Systems". The seller is "voodublu" and is located in New York, New York. This item can be shipped to United States.